I was reading a blog earlier today and the writer began by apologizing for her post being ‘from a personal perspective’. Yikes! I tend to make things personal, and wasn’t aware that this might be a blogging no-no when it comes to being taken seriously. I spent much of the afternoon thinking about it, and realized: I don’t really care. I’ve never been one for convention, so why start now? Anyway, the irony in reading her blog was that shortly thereafter, I learned a new concept (one of many today, in fact. It was my orientation day for the SFI program at OCADU.). 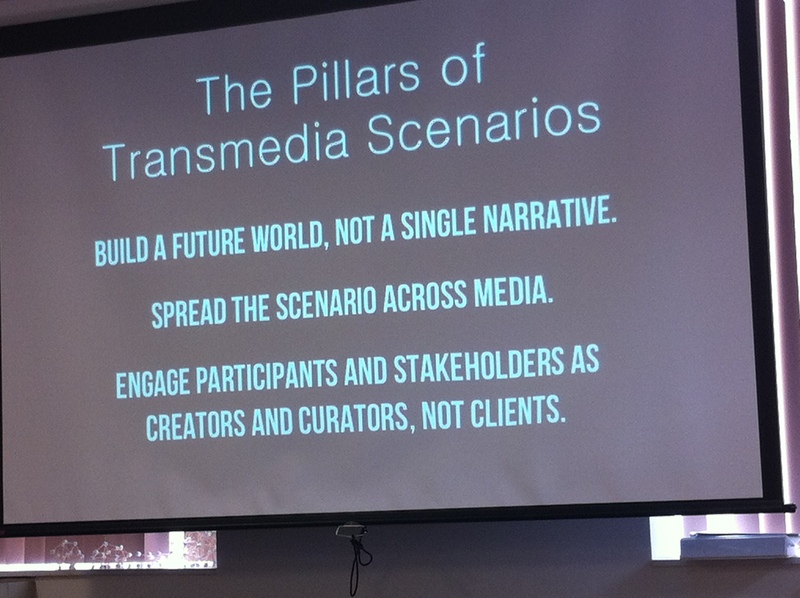 The concept is called “Transmedia”. It was one of many new terms that flew past me in a haze as I struggled to reorient myself into student mode. The presenter who spoke of transmedia, Trevor Haldenby, was an engaging speaker whose presentation contained nuggets I was able to grasp, despite my fledgling vocabulary with regard to ‘design thinking’. It feels exciting to be challenged and humbled this way. Transmedia, as far as I understand it (ie: simply), has to do with storytelling through a variety of different media. In my former (currently dormant) art practice, I often spoke of being interested in narrative, storytelling, and subjectivity – so transmedia caught my eye. Here‘s an article – grabbed somewhat at random by me – that can give you a little more insight into what it’s about. Image taken from OCADU SFI presentation by T. Haldenby. Used without permission. What strikes me here is how these three pillars might be translated into talking about a shift in teaching pedagogy. Bear with me here, because I know I’ve said my focus is less on pedagogy and more on systems thinking. 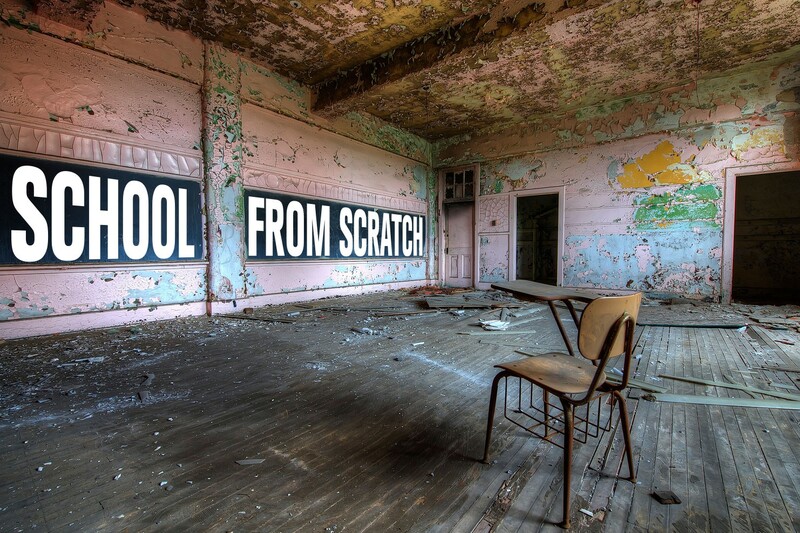 However, systemic shifts will no doubt result in pedagogical shifts, and vice-versa. So, to that end, I was struck by how these three pillars might be seen through the lens of teaching. 1. Build a future world, not a single narrative. I’m often struck at how linear and ‘singularly narrative’ (if that is such a thing) our curricula are. Sure, many steps have been taken to try to make learning content more reflective of diversity and inclusion, but let’s face it: there’s still a tokenistic feel to it in many ways. Truly understanding and valuing the diversity of perspectives, experiences and backgrounds in the classroom often does not occur. [The fact that a video like this, when seen by students in midtown Toronto, provides an ‘a-ha’ moment perhaps supports my point] We are still building this single narrative – ‘western’, Euro-biased content and perspectives – as the status quo. Going back to the notion of making something ‘personal’: the student who does not feel ‘seen’ in our current practice is not only alienated, but – it might be argued – immediately disadvantaged because of that perceived hierarchy I wrote about in my last post. Thinking of learning in a whole-world way, truly as a fabric of multiple narratives, might drastically alter the way we consider teaching and schooling. Am I making sense? 2. Spread the scenario across media. My interpretation here is pretty simple for now. I’m reading it somewhat literally and thinking about how schools currently limit access to media, in that most of our public schools are lacking in technology that is both up-to-date and ubiquitous enough that all students can access it fairly. Many students have complex relationships with multiple media platforms in their ‘real lives’, and scale back when they come to school. Of course, media needn’t mean digital technology – books are a form of media, after all – but the point here is that providing multiple access points for learning will enhance the experience and make it as accessible as possible. Oh, and it also makes it more fun and engaging. Which, I will always argue, is a good thing. 3. Engage participants and stakeholders as creators and curators, not clients. This is an essential one for educators to consider, because students are currently referred to in the system as ‘clients’. There is a disconnect that happens between teacher/student when the child is a ‘client’. It creates an arms-length rapport that limits student input and makes him/her more passive. A client is someone to whom a service is delivered – s/he is a recipient. Thinking of students as creators in their own learning immediately adds a layer of engagement and obligation. The obligation, however, is to the students themselves – it creates a kind of agency that many students (sadly) do not feel currently. I’ve taken Haldenby’s pillars completely out of context here, and for that I apologize to him if it seems inappropriate. I should add that in his case, he used these pillars in an incredibly complex, layered experiment of sorts. His goal was (if I understand it correctly) to ‘sell’ to people the value in futures thinking – to get people to truly understand how exploring future possibilities is a valuable and worthwhile endeavour. In this case, he and his team developed a hyper-realistic fake company that produced a series of fictitious but real-seeming lifestyle products that one my conceivably believe will exist in the future. Through this fake company and its products, they mounted a long-term, elaborate study (disguised, for lack of better wording, as an interactive media/marketing blitz) that actually involved the public as participants. In some cases, people didn’t even know initially that it wasn’t real. Their purpose was to show how ‘doing’ will ultimately result in the greatest degree of understanding of (and appreciation for, or empathy with) a project or concept – in this case, the value in futures thinking. Essentially, it seems they took a real-life learning model – an integrative approach, where participants were their own agents (for participation, for learning, for engagement) – and used it in a public/private sector situation. And it worked! And it was really cool! And I could see it working with anyone – including elementary students. If you’re curious about Haldenby’s project (the ‘company’ was called Byo Logyc), through his ‘adventure laboratory’ The Mission Business, you can check it out here. Circling back around to the start: to me, the key element of success in Haldenby’s experiment was that it relied on personalization. People ‘bought’ the story because they were able to relate it back to themselves and it became meaningful to them. There is inherent value in personalization where engagement and learning is concerned. We can’t remove emotion from life experience – and why would we want to? It’s simple talk that we often discuss in teaching, but how far do we take it in reality? These three pillars are worth considering when we consider how we structure learning environments. Really, all learning is subjective. So why pretend it’s not? Why not acknowledge ourselves in the context of our learning and highlight it – our biases, our perspectives – and use it to increase engagement?